Vasilopita is a traditional cake or bread served on New Year’s Eve to celebrate the life of Saint Basil. After baking the vasilopita, a coin is inserted through the base and when cut the person who finds the coin is said to be granted luck for the rest of the year. Preheat the oven to 200C. Start by dividing the eggs into yolks and whites. Place the egg whites in the bowl of the electric mixer, along with a pinch of salt. Whisk the egg whites until the mixture is very thick and glossy and a long trailing peak forms when the whisk is lifted (meringues). Place the mixture in a bowl and set aside. Use the electric mixer, to mix the butter and sugar, for about 20 minutes, until the butter is creamy and fluffy, like whipped cream. Add the egg yolks, one at a time, whilst mixing, allowing time for each one to be absorbed, before adding another. Pour in the orange juice, the vanilla extract, the orange zest, the yogurt and mix to combine. Add 1/3 of the sifted flour and blend using a spatula. Add 1/3 of the meringues and blend with light circular movements from the bottom up. Repeat with the rest of the flour and meringue (adding 1/3 of the flour and 1/3 meringue and then the remaining flour and meringue). Butter the bottom and sides of a round non-sticking cake tin (approx.32cm diameter) and pour in the mixture. Place the cake tin in the preheated oven, on the lower rack, turn the heat down to 175C and bake for 50-60 minutes, until nicely coloured and cooked through. Check if the vasilopita is ready, by sticking in the middle of the cake a wooden skewer or toothpick. If it comes out clean, then the cake is ready. Let the vasilopita cool down and flip the pan on a plate. 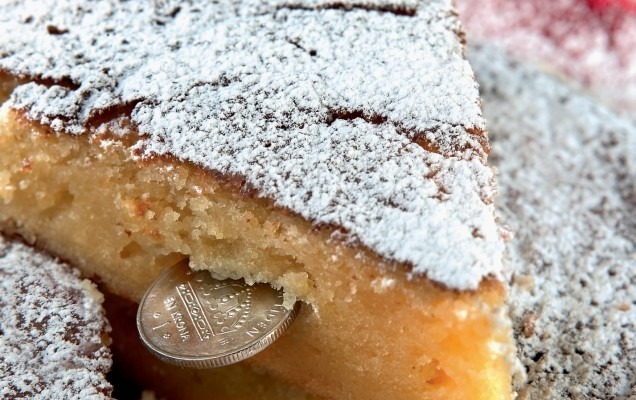 Wrap a coin with aluminium foil and stick it in the cake from the base. Transfer cake to a serving platter and dust with icing sugar.